[Webinar] 19 Rebranding Questions to Ask with David Brier . ', failHtml: "
A must-see webinar presented by world-renowned branding expert David Brier. "David Brier is brilliant with branding." Sooner or later, every company faces the big question—to rebrand, or not to rebrand? It’s a valid question. And asking it means you’re focused on doing things right. But few companies know how to successfully pull off rebranding that’s disruption-free. 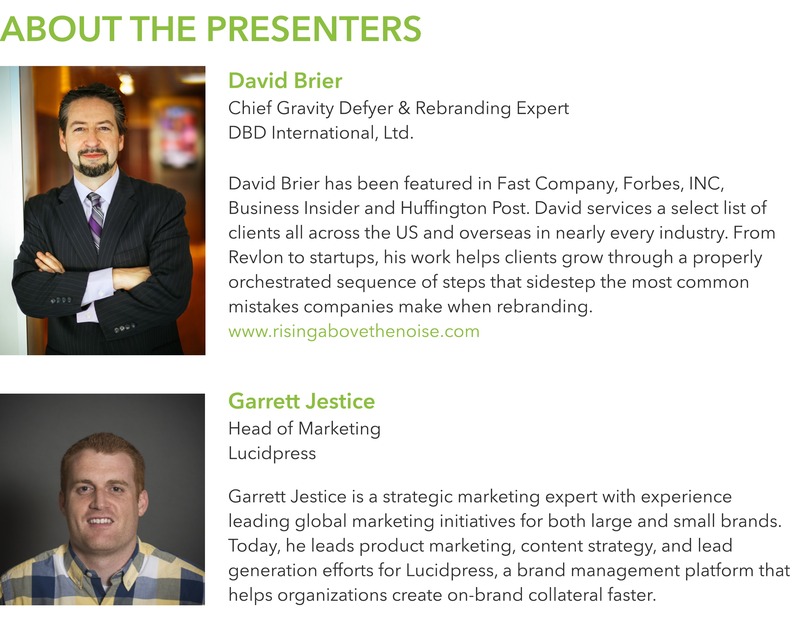 Join one of the most sought-after rebranding experts in the industry, David Brier, and Garrett Jestice, Head of Marketing at Lucidpress, for this hands-on webinar that tackles 19 of the biggest questions every company faces (or should face) as they venture down the road to rebranding. 1 How do you successfully navigate stakeholders with differing objectives? 2 Is there a difference between a B2B rebrand vs. B2C rebrand? 3 What vital decisions need to be considered to set your brand up for long-term success? Not just a “theoretical” discussion, this webinar will demonstrate rebrands-in-action across a wide variety of industries, from food to technology to the rebranding of an entire Midwestern city. This is certainly a live webinar you don’t want to miss! Exclusive bonus: All webinar attendees will receive a FREE copy of David's new ebook, The Roadmap to Successful Brand Creation, which includes David's proprietary formula and never-before-seen examples of successful rebranding.